AMBULANCES were called to Northern Ireland’s prisons over 1,100 times in the last three years, The Detail can reveal. This works out at an average of one ambulance call out per day for a total prison population of around 1,800 people. The figures released by the Northern Ireland Ambulance Service to The Detail in response to a Freedom of Information request show that over 80% of the calls were made from Maghaberry Prison in Co Antrim, Northern Ireland’s only high security jail. In 2012 an enhanced healthcare landing in Maghaberry prison was closed, though mental health and clinical addiction services were retained. Each time an inmate is sent to hospital they must be accompanied by a prison officer. The Prisoner Officers Association (POA) says this has huge financial implications in terms of overtime and also impacts on staff availability for normal prison duties. In January this year the POA called for prisoner healthcare to be centralised at a dedicated facility in one of Northern Ireland’s hospital sites. Reasons for call outs to prisons revealed today included sexual assaults, strokes, overdoses and treatment for burns. Some calls outs for ambulance crews lasted several hours. Ambulance crews spent over 12 hours at Maghaberry Prison in November 2013 after a fire was declared as a “major incident”. Three patients were attended to and brought to Craigavon Area hospital in this incident. A spokesperson for the ambulance service confirmed that the “major incident” was in relation to a fire within Maghaberry prison. Since 2008 prison healthcare has been the responsibility of the South Eastern Health and Social Care Trust. In a statement to The Detail the South Eastern Trust said the prison population had “increased health needs due to impact of socio-economic factors” and would therefore access healthcare more frequently than they would in the community. 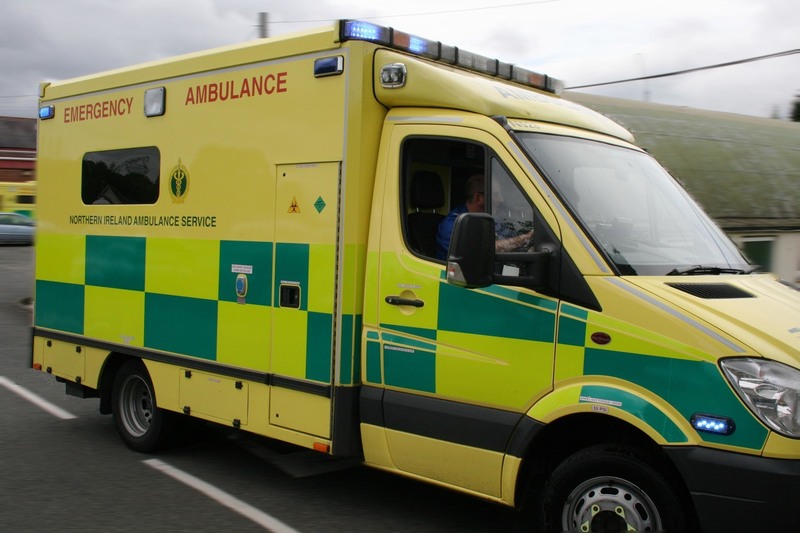 A spokesperson, however, added: “The trust is currently reviewing protocols and working with the prison service to reduce the number of emergency ambulances called to prisons in Northern Ireland. There is no in-patient health facility at any of Northern Ireland’s three prison sites but there are some medical staff based within prisons here. In-patient services for prisoners are provided by hospitals within the community when needed. The FOI figures obtained by The Detail show that over the last three years there were 1,114 calls made from prisons in Northern Ireland for an ambulance. This resulted in 1,377 ambulances and 2,473 crew members being dispatched to attend to 1,093 patients within the prisons. The figures do not specifically state whether the call outs were for a prisoner or a member of staff but a spokesperson for the ambulance service confirmed that the vast majority of call outs related to medical emergencies for inmates. The number of inmates represents a small portion of Northern Ireland's overall population, with approximately 1,800 prisoners held at the three prison sites at any one time. It is up to staff within the prison to decide when a prisoner is in need of hospital care and when to call an ambulance. Maghaberry Prison is a high security prison in Co Antrim, housing adult male long-term sentenced and remand prisoners in both separated and integrated conditions. The figures obtained by The Detail show that ambulances were called to Maghaberry on 894 occasions between 2013 and 2015, accounting for over 80% of the call outs to prisons during this period. Reasons for calls out included treatment for overdoses, poisoning and eye injuries. Last year prison inspectors found that Maghaberry Prison was at risk of “serious disorder or loss of life". In February this year inspectors said the prison had stabilised but that a significant amount of work remained to make it safer for prisoners and staff. Magilligan Prison based in Limavady is a medium security prison, housing shorter-term adult male prisoners. Since 2013 ambulances were called on 100 occasions for a number of reasons including strokes, diabetic problems and falls. Hydebank Wood prison site is the location of two prisons for young offenders and female prisoners. An ambulance was called on 121 occasions for reasons including treatment of burns, sexual assaults and on two occasions calls were classified for “pregnancy/childbirth/miscarriage”. Click here to view a full breakdown of all the reasons why ambulances were sent to prisons in Northern Ireland. In January this year during evidence to Stormont’s Justice Committee, the Prison Officers Association (POA) called for the establishment of an outside facility in one of Northern Ireland’s hospital sites where prisoner healthcare could be centralised. During the meeting the POA's Ivor Dunne said: "In December last year, we sent 11 prisoners to outside hospitals. That took up 44 staff over 24-hour periods. The overtime budget was taken out of the prison and put to an outside bed watch, leaving staff on the landings locking down prisoners who should not have been locked down." A spokesperson for the trust added: "Any model of healthcare must be in keeping with regional DHSSPSNI strategy for services, appropriately funded and have a clear statement of purpose." The most common reason for ambulances being sent to prisons here was a Health Care Professional (HCP) Admission with 284 call outs in total. A HCP admission is when the hospital doctor or a visiting GP determines that a patient needs to be brought to hospital by ambulance. In 117 cases the ambulance call out was stopped, in 89 of these cases the patient refused to travel to hospital and in two cases the call was stopped because the patient had died. Craigavon Area Hospital had the highest number of attendances from prison with almost 500. In one case two ambulances were dispatched to deal with a “hemorrhage/laceration” and the patient was recorded as being brought to the Royal Belfast Hospital for Sick Children. Click here to view The Detail’s recent investigations into prisons in Northern Ireland.